Sign-up today to receive regular e-flyers with specials and new product announcements. Consolidated Turf Equipment carries a wide variety of high-end tools perfect for all of your landscaping requirements. Whether you’re a landscape professional, contractor, golf course groundskeeper or quality conscious homeowner, Structron® brand premium quality fiberglass handle tools are the right choice. 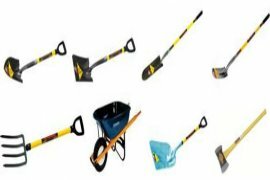 Choose from a wide selection of lawn and garden tools including shovels, rakes, hoes, weed & brush cutters, pruning tools, snow tools, contractor tools, striking tools, wheelbarrows, brooms, scoops, ring fasteners & ringer pliers, and other specialty products.